Home → Copiers → Konica Minolta C454e: Why buy this copier? Printers have reached a whole new plateau of inter-connectivity, and none are doing it better than the Konica Minolta C454e available from Arizona copiers. 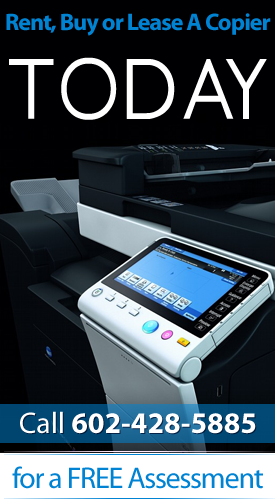 In addition to being a hub for all of your document needs within your local network, the new Konica Minolta C454e can connect with any mobile device, giving printing on the go new meaning. Thanks to the innovations made possible with PageScope Mobile technology, even scanning falls within the list of features that can be performed in tandem with any mobile phone or tablet in the vicinity. Businesses are quickly discovering the huge advantages of being able to work with a variety of types of networks and data sharing or back-up services without having to expand operation costs. The Konica Minolta C454e can access all types of cloud networks, and it works flawlessly with Google Drive and Dropbox. The high volume capability of this new product comes ready-to-use, and its controls are completely intuitive. The INFO-Palette design interface makes performing every action a mere matter of touching a few keys. The same experience to which people have grown accustomed when operating their tablets and PCs has been seamlessly integrated into this machine. The number of functions it can perform make it an incredible buy. Additionally, it is not a one-way device. Hardcopies that you scan can be quickly converted into Microsoft office documents and transferred to any device for optimal mobility options. There are many different file types to choose from when converting documents: conventional PDFs, compact PDF files, encrypted PDFs, and searchable PDFs. This ability allows your data to stay in motion yet always be secure. There is no lack of performance in the konica Minolta C454e when it comes to executing traditional function either. The stunning color printouts it delivers feature high-quality resolution with crisp details. The 1,200 dpi performance works in a full-range of colors in a variety of sizes, removing the worry in regards to professional appearances during your next presentation. Business owners shopping at Arizona copiers can also rest easy in knowing that they are purchasing a product that is designed with helping the environment in mind. The Optimized Printing Service built into each unit reduces TCO while working and reduces the amount of energy it requires to keep the machine operating. The Konica Minolta C454e works with a variety of paper weights, ranging from 14-lb bonds all the way up to the 140-lb index. The dual drawer setup allows for maximum efficiency in operation, and the monthly duty cycle is capable of handling up to 150,000 impressions. The more cutting-edge and versatile your hardware, the more efficiently your business will run. 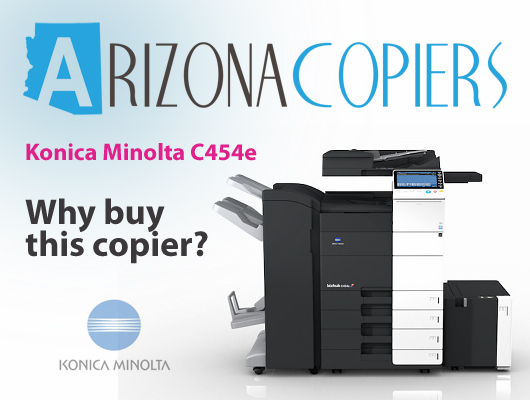 Arizona color copiers takes this message to heart, proudly offering the Konica Minolta C454e to their customers at extremely competitive prices. They have new and used units in stock, making upgrading your business capabilities a fast and affordable process. They has been a major supplier of leading hardware to businesses in the Phoenix and Tucson areas, and their friendly knowledgeable staff can walk buyers through all the great features and subtle nuances of the groundbreaking, new Konica Minolta C454e.